This 21-room hilltop mansion, which was completed in 1901, may have more to it than its beauty and historic value. 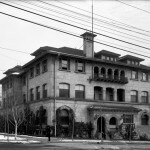 Its former owners, the McCunes, donated it to the Mormon Church in 1920 and it was a school of music until 1953 when it became Brigham Young University’s Salt Lake City Center. Now restored, the house, available to tour groups of 10 or more by appointment, may have a few secrets within its walls. Witnesses say an organ here plays by itself, furniture moves, and cold spots are plentiful. Some folks have seen the apparition of a little girl and heard unexplained voices and giggling, especially at weddings, and at Christmastime, an apparition of a man in a black cape has been seen. This house is haunted, but not in a frightening way. I was on a Historic Homes tour there several years ago. While sitting in the bay window of the ballroom on the top floor, I saw a dark-haired lady in an elegant yellow ballgown waltzing. There were other people there, but they were muted, in the background. It was a lovely moment for me, that empty room still holding a memory from a long-vanished time.